Davines Love Lovely Smoothing Conditioner 2.5 oz is rich creamy formula that controls frizz and gives shine. 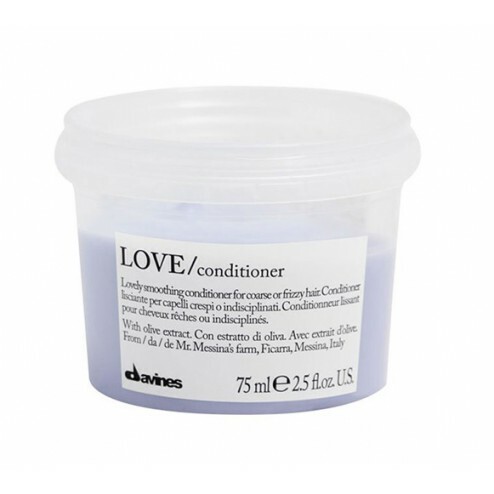 Davines Smoothing & taming cream conditioner for harsh and frizzy hair. Hair appears naturally smooth, shiny and soft. Active Ingredients: Rice wax, Borage seed oil, High Mineral salt. 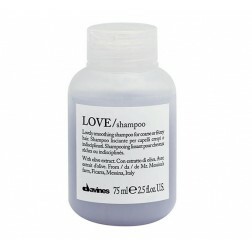 Use: After shampooing, eliminate excess water and apply the product to the entire hair shaft and ends. Comb through and leave a couple of minutes. Water (Aqua, Eau), Cetearyl Alcohol, Behentrimonium Chloride, Glycerin, Cetyl Alcohol, Dimethicone, Cetrimonium Chloride, Hydrogenated Polydecene, Phenoxyethanol, Borage (Borago Officinalis) Extract, Oryza Sativa Cera Bran Wax (Rice), Amodimethicone, Panthenol, Polyquaternium 10, Hydrogenate Palm Glycerides Citrate, Tocopherol (Natural Vitamin E), Benzophenone 4, Propylene Glycol, Trideceth 12, Helianthus Annuus Seed Oil (Sunflower), Methylparaben, Ethylparaben, Propylparaben, Disodium EDTA, Potassium Sorbate, Citric Acid, Red 4 (CI 14700), Blue 1 Lake (CI 42090) (CI 42090), Parfum (Fragrance).